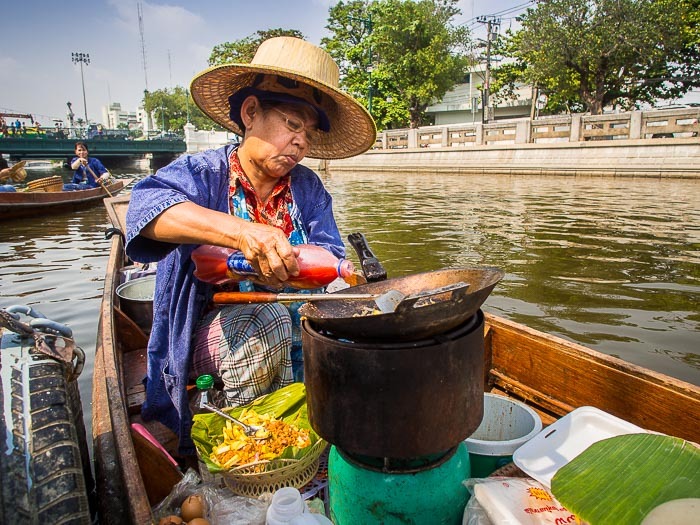 A vendor in the Bangkok's newest floating market cooks up an order of pad-Thai for a customer. 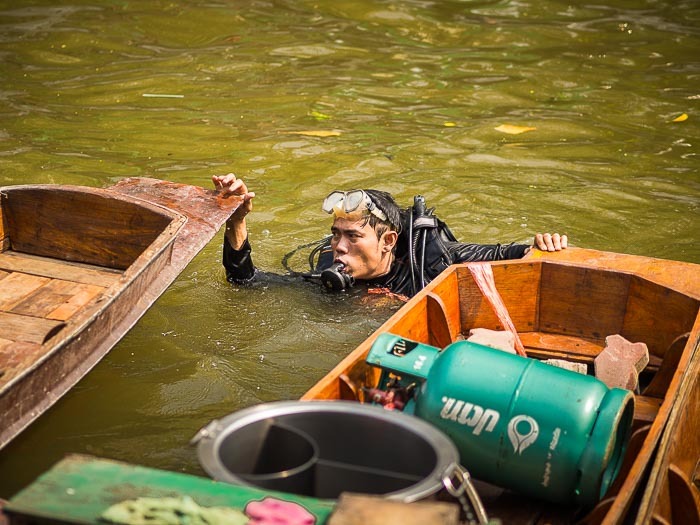 Bangkok used to be known as the "Venice of the East" because a network of canals (called "khlongs" in Thai) crisscrossed the city and people used boats to get around. Shopping was done on the canals, vendors poled or paddled their canoes through the community. Now most of the canals have been filled in, paved over and turned into roads. The canoes have become pushcarts and motorcycles. There are still a few canals in daily use on the Thonburi side of the river and even a few floating markets on the Thonburi canals (but truth be told, the floating markets in Thonburi are tourist attractions). There are only a couple of navigable canals left on the Bangkok side of the river. One is Khlong Saen Saeb, a canal dug in the early 1800s to ferry Siamese (Thai) troops from Bangkok to the Cambodian border. Saen Saeb still has regular commuter boats running up and down it. The other, Khlong Krung Kasem, was originally dug in the 1850s to be a moat around Bangkok. It hasn't seen regular boat service in decades. 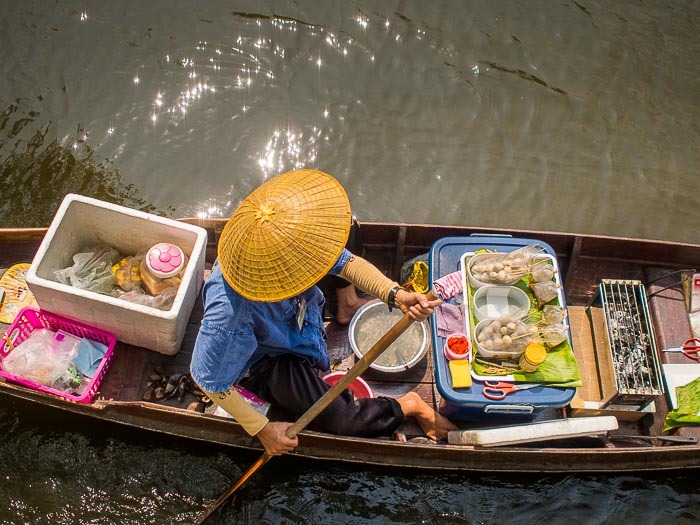 A grilled meat vendor paddles down the Khlong. Krung Kasem passes along the south side of Government House, the office of Thai Prime Minister General Prayuth Chan-o-cha. Since seizing power in a coup last May, the Prime Minister has stressed a return to traditional Thai values. He saw the canal sitting there unused and suggested it to be turned into a traditional floating market. Work crews started cleaning out the canal, flushing the stagnant, fetid waters with slightly less fetid water from the Chao Phraya River, clearing out the dead bodies (seriously, work crews found human remains in the canal during the clean up) and within weeks the new floating market was open. The new market will be open in the afternoons. Yesterday, the first day, it was busy with Thais from offices in the area. They came down to the canal to check out the floating market and order food from the vendors in canoes. Most of the canoes were moored to the shoreline. People walked on floating docks while safety divers stood by just in case things didn't go according to plan. The floating market should be open until March 1. A safety diver inspects canoes just before the opening of the canal. There were more Thais there than I expected and fewer tourists than I expected. I thought it would be packed with farangs but it wasn't. I saw just a couple of foreign tourists who ventured out to see what the hubbub was about. 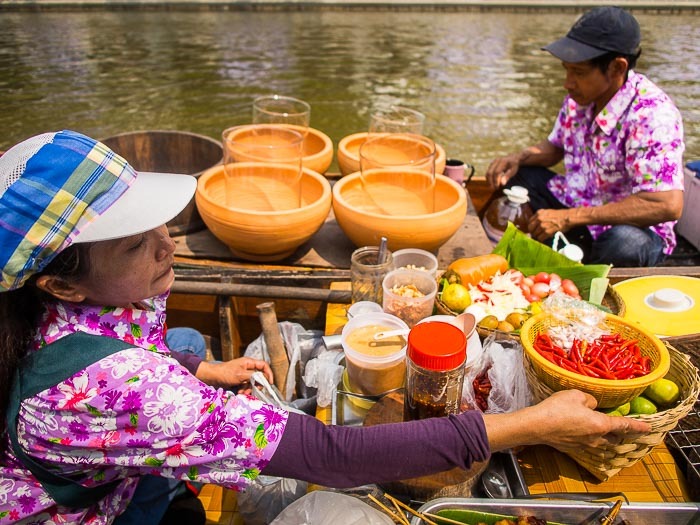 A som-tam (spicy papaya salad) vendor on the canal. There are more photos from the floating market in my archive.